Conceptual Ewoks Wicket Mock-Up: The figure on the left of this photo is a really intriguing piece. It's simply a regular Wicket figure from Kenner's standard ROTJ line, which has had some important modifications made to it. First of all, the face has been re-painted in a more cartoonish manner. Most notably, the figure's normally undetailed eyes have been embellished with some pupils and a yellow background. Secondly, the cowl of the figure has been re-shaped and painted an orange color. At first look, this might seem fairly uninteresting. But James has a theory about this piece, which I think is probably correct. He feels that it was created in order to represent how Kenner's Ewoks Wicket figure would look. 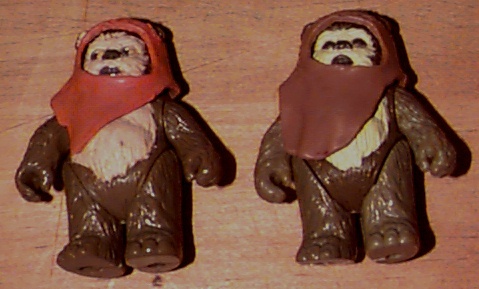 We might surmise that, before beginning development of their Ewoks line, Kenner received design information pertaining to the characters in the animated series. They then may have made this figure in emulation of the design for the animated Wicket. It's even possible that they explored the option of recycling the pre-existing ROTJ Wicket, in order to save on developmental costs. Whatever the case may be, I think it will be evident to anyone looking at the second photo that the mock-up figure bears a distinct resemblance to the Ewoks Wicket seen at the left. The similarity between the two figures' cowls is particularly striking. Of course, collectors have to be wary when buying this sort of thing, since it can be whipped together rather easily. But James bought this from a good Kenner source and is confident of its legitimacy.